Chalk pens and paint pens are tools I use almost daily in my work. When I first started making signs it was difficult to navigate which pens were best. The process of finding which pens work best with each material has been a costly one for me. I’m happy to say that I have found my favorites though! I hope that my blog saves you a little money, a lot of time and helps you discover which pen you like using the most. As a disclaimer, I would like to say that I have many friends who do signage as well and we all have varying opinions about which pen is our favorite. Part of your “artist journey” is figuring out the tools you like to use the most! Below is my personal opinion about each pen I have used. We will start out with my ALL time favorite pen…. the MOLOTOW paint pen. Which I just discovered about 6 months ago. This is pretty much the only paint pen I use now when I am writing something that I need to remain permanent. If you are new to calligraphy, and you want to be able to wipe off your work easily because you are scared of a mistake, it may may not be the pen for you. You can wipe it off VERY quickly with a wet microfiber cloth right after you write with it, but once it’s dry, it will leave an outline no matter what. I order mine from Amazon, but I know Blick Art Materials carries them as well. Next in line on my list is the Sharpie WATER-BASED paint pen. I’ll be candid with you, I was not a fan of Sharpie paint pens for a very long time. Just recently I started using them again and I really like them. I’m not sure if they changed the formula or if I just became more patient when shaking the pen to get the ink running. This is my go-to pen for my reusable wood signage and writing on glass (when I need it removable). I recently did a wedding where they wanted me to write on the large glass door leading into their venue and this paint pen worked great and was easily removed after the event. I usually get mine from Michaels, but you can find them just about anywhere these days. Not to be confused with the Sharpie WATER-BASED paint pen above, this is a Sharpie OIL-BASED paint pen. There is a HUGE difference, so please take care to read the label. You can see that the oil-based pens have a magenta colored label and the water-based a blue label. I struggled with this paint pen for a while, you really have to shake the heck out of it before you press down to get the ink running. I think this is due to it being oil based, it needs more motion to get the ink flowing. What I experienced was the oil coming out but not the paint…. once I got the hang of shaking it correctly (and for the correct amount of time) it worked well! I get mine from Michaels, but most places will have them. 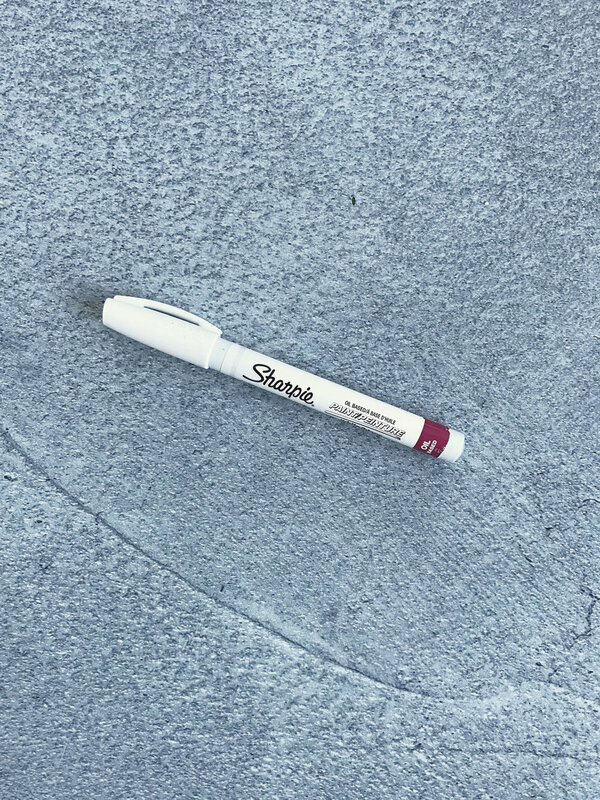 This chalk pen takes me down memory lane, there will always be a soft spot in my heart for this little guy because it’s one of the first chalk pens I ever used! 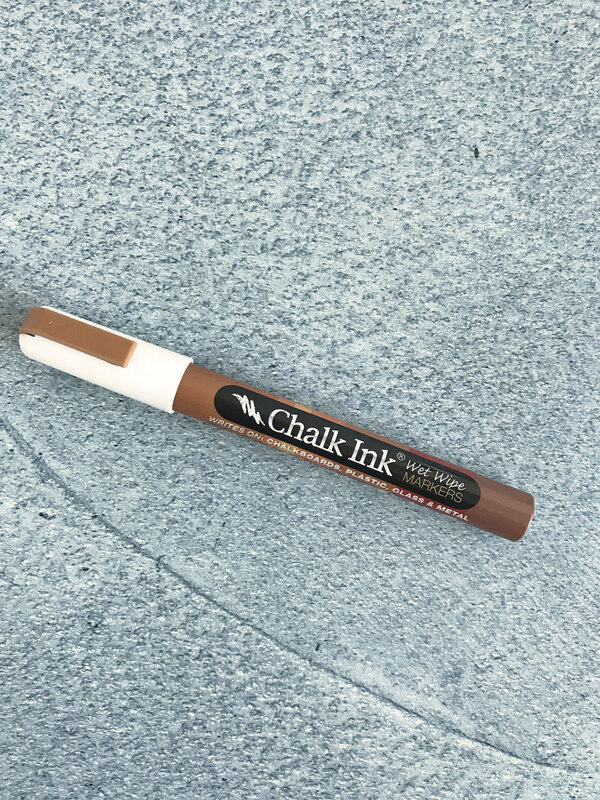 Even though it says it can be wiped off with water and a towel, it almost always leaves a trace of the chalk ink behind. Making it not ideal for reusable surfaces. Another pen that I really love, but don’t use super often because they aren’t quite as permanent as I would like them to be! Versa Chalk makes a great CHALK marker. 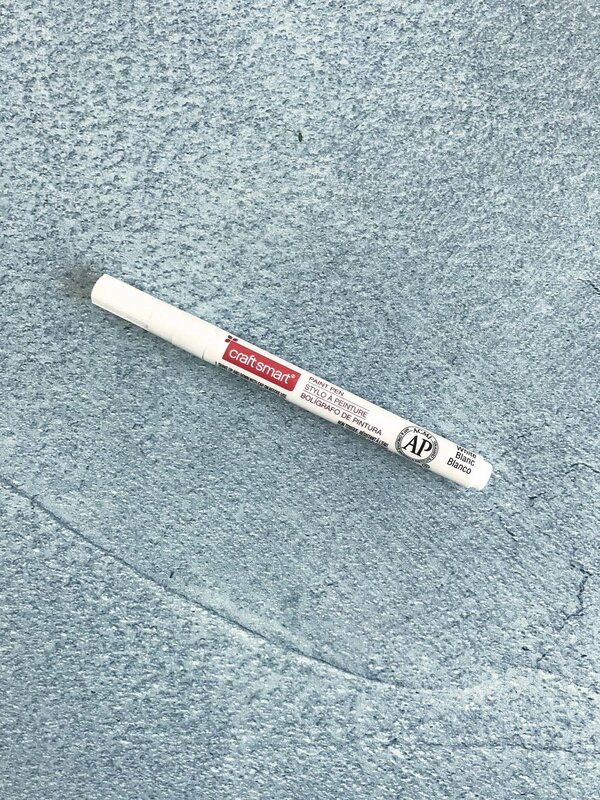 It is very removable and I suggest this chalk pen for my students who are beginners. I have friends that really love this chalk pen. I never really got on the train of loving this one. To me it’s inconsistent in quality. I see these at Michaels all the time and with a 40% off coupon (which Michael’s always has available) it’s the cheapest option. I really don’t recommend this pen, so I’m not going to talk about it anymore lol! This is not a chalk pen, it is a paint pen. I use these on A LOT of materials. I personally love these pens but I know a few artist friends that do not. Like I said in my intro, it’s important for you to find the pen that works for you. Personally… I LOVE this pen. This is my go-to pen for surfaces I can’t use other pens for. I’ve used this on wood, chalkboard, acrylic, plastic, marble, agate, tile, rocks, shells, leaves… just about anything you can think of! You can find these just about anywhere, I’ve found them at Michaels, Blick art materials, Amazon etc… I typically purchase from Paper Ink Arts though. A word to the wise… pay very close attention to what size you are ordering, they have lots of different sizes, and there is also one with a chiseled tip (which I don’t recommend). Thanks for reading along and I hope that my little review of these chalk/paint pens is helpful for you. Sometimes the best thing you can do is just try them out for yourself! There is a very popular calligrapher who swears by Elmer pens… I tried them out and found them to be awful! However, this artist loves them and she produces beautiful work with them. The moral of the story … you need to find what works for you! I’d love to hear your thoughts about the various paint pens or answer any questions you may have! Feel free to comment below!